A bedtime read with more ‘ahh’ factor than a John Lewis festive advert. So sweet you’ll cry. 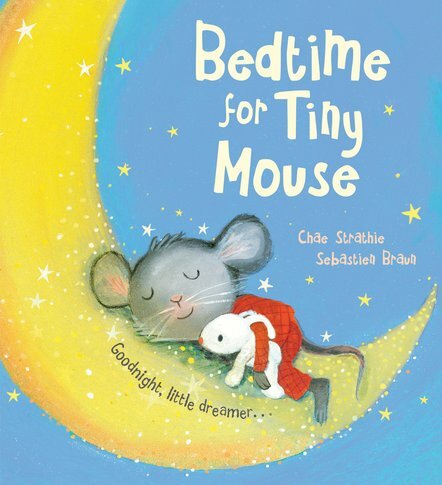 One tiny mouse and his stuffed bunny rabbit must find the perfect way to fall asleep. Tiny Mouse curls and twirls, flips and flops, and snuggles and huggles. But he can’t get to sleep. His dad gives him a cup of warm milk; his mum tells him to count sheep. Even his big brother tries to help. But nothing works, until Grandma arrives with her soothing ways… There’s nothing quite like Chae Strathie’s whimsical picture book fantasies. Bedtime reading to share with your favourite people before you nod off sound asleep. 610L Lexiles are the global standard in reading assessment. They are unique as they are able to measure a child and a book on the same scale – ensuring the right book gets to the right child at the right time.